In an interview to RT, former Kyrgyz President Askar Akayev said the end has come to Kurmanbek Bakiyev’s era, as it is a logical end for a regime that came to power thanks to a “color” revolution and based on repression. RT: What happened in Kyrgyzstan in the last few days is reminiscent of exactly what happened there five years ago when the Tulip Revolution swept Askar Akayev from power. And he joins me now here. Thank you, Mr. Akayev, very much for talking to us. So it seems that history is repeating itself. Why is this happening? 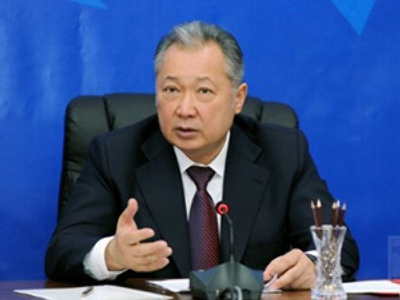 Askar Akayev: I think that it’s a logical result of Bakiyev’s rule. It’s the logical end to the power which came by means of a takeover and with help of violence. All “color” revolutions were run according to a similar scenario – the Rose revolution in Georgia, the Orange revolution in Ukraine, as well as the Tulip revolution is Kyrgyzstan, which actually transformed into a takeover. And the fact that today all the color revolutions have come to a similar end is logical too. Of course there were objective reasons: the social and economic problems, poor living conditions and the economy had not yet recovered from the collapse of the USSR, especially in Georgia and Kyrgyzstan. The living conditions were far from perfect, and there were objective social reasons which encouraged the color revolutions, and in the case of Kyrgyzstan also a takeover. The people had high expectations of the revolutionary powers and government, that the West would provide the revolutionary government with more substantial assistance, and that the living conditions would improve fast. But we all know that the democratic mottos were not a goal in themselves, but they were a means of achieving their own national aims to seat pro-Western governments in those countries, to have pro-Western leaders and to reach their own national goals, to increase their presence and influence in those strategic regions. I think that people quickly figured it out. Then the people saw that their hopes for better living conditions and a fast rise of the economy and the further deepening of democratic processes were in vain. And this fiasco would have happened a year ago. It did not happen a year ago only thanks to Russia’s extended and generous assistance. In 2009, Russia allocated half a billion dollars to support the Kyrgyz people, and of course the Bakiyev regime – a $150 million grant, and a $300 million preferential credit wrote off a $200 million debt. It helped to tide Kyrgyzstan over although a very small part of this money was put to good use, and the biggest part of it was stolen. RT: Bakiyev came to power five years ago promising a more democratic society, a greater respect of human rights and improved living conditions. Where did it all go wrong? AA: In 2005, a takeover by political extremists took place, and the criminal militants were the main crushing power. And when Bakiyev came to power, he cared only about strengthening his personal power – they did not want democracy in principle. That’s why Bakiyev’s regime eliminated almost all freedoms, and the beginnings of democracy which used to be in the republic. To improve his power, Bakiyev created a regime of repressions. There were a lot of contract murders, many opposition leaders were killed, journalists were beaten up and there were even cases of journalists being murdered. They closed offices of mass media in Kyrgyzstan. Of course all these measures aggravated the situation, and in my opinion Bakiyev ended his bloody rule by giving the order to fire on his people. And I am sure that his fate will be sad – he passed the sentence on himself. RT: Do you think this is the end of the Bakiyev era? Or is there any way for him to come back? AA: I rule out the possibility of Bakiyev returning to power, because by today he has led the people and the country to a catastrophic point. And of course we can view April’s events as an uprising against Bakiyev's regime, because he had led the country to political, economic, and moral collapse. So he won’t get support in any part of the republic. So I think that an end has been put to Bakiyev’s regime. The only power Bakiyev can resort to now is criminal elements with whom he created the takeover in 2005. RT: Although it is calm in Kyrgyzstan now is there any chance that it will spark again? Could we see a civil war? AA: I think that there will be no ethnic confrontation, even in the south, because both Kyrgyz, and Uzbek people, and the people from the north and south of the country lately have been very indignant about Bakiyev’s ruling and his administration. That’s why I am sure that the bloodshed will stop now, the republic will calm down and will start building a peaceful life. RT: Under Bakiyev, the country turned towards America and away from Moscow. 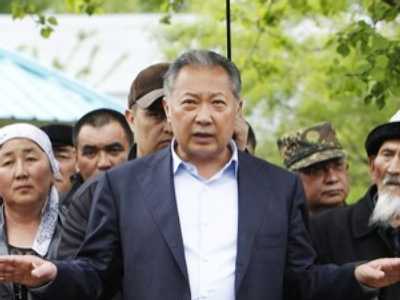 Would you, Mr. Akayev, expect any change following the recent uprising? AA: You are right that recently Bakiyev in his foreign policy oriented more towards the United States, and it was displayed in the initiative to create a second American military base, in the Fergana Valley by the way, where the interests of all the middle east states meet: of Kazakhstan, Uzbekistan, Tajikistan, Kyrgyzstan. Of course it caused irritation on the part of all the authorities of the neighboring states. I think it was a big mistake. I called his foreign policy “weathercock diplomacy” – he based his policy on bargaining. In other words he turned to those who offered more. And of course this couldn’t but raise irritation in Moscow, since Russia has always given generous financial assistance to the Kyrgyz Republic. Last year Russia gave half a billion dollars – the major part of it was a grant, and also an interest free loan to support Kyrgyzstan’s economic development. That’s why I think it was a gigantic mistake. You should also take into consideration the fact that a million migrants work in Russia and their money transfers are about 50 per cent of the budget revenue inflow for the Kyrgyz Republic. In this situation, a turn towards the United States was not diplomatic and it was wrong in all respects. I am sure that Kyrgyzstan has no alternative. Kyrgyzstan must strengthen friendly ties, develop and deepen co-operation in economic and other areas with Russia. I have always viewed this – even in the years of my presidency – as our way. And I have always said that Russia has been given to us by God and history. Those who look into history understand that of course we are to develop relations with the United States and with the other countries, but all the same our strategic ally is Russia. And today when the republic is in a catastrophic state, because Bakiyev’s regime caused great damage to the political and moral, international image of the Kyrgyz Republic, and our economy today is on a precipice. So today it will be hard to return the republic to the way of evolutionary development without Russia’s help. And I think that the temporary government has learned the lessons of the Bakiyev regime, and probably the country will turn towards Russia. I am hopeful of that. RT: If Kurmanbek Bakiyev officially steps down, is there any way back for you? Are you looking forward to a return to Kyrgyz politics? AA: I exclude any chance of me going back into politics. I am a professional scientist, and after the events of 2005, I returned into my sphere and I am doing scientific research in mathematical research and complex systems. I am a physicist and mathematician by profession and I find great satisfaction in it. That’s why I do not see any reasons for me to change anything in my life and go back to politics. Right now I want to be remembered for my scientific work; and I think that Kyrgyzstan needs new leaders from among the new generation. I am sure that there are such people in Kyrgyzstan; and in the period of my presidency there were many talented and highly-qualified employees – economists, engineers, financial experts, and experts in all spheres. And I think that it will be good for Kyrgyzstan to have a democratic election to the parliament. A parliamentary election will be able to sort out the new young leaders from the new generation; later on, we will be able to elect a new president from them. Look at all the successful presidents now – they are all from a generation that grew up in the years of democracy and independence. There are such people in Kyrgyzstan. RT: Mr. Akayev, how do you see the Kyrgyz future? AA: Right now after Bakiyev’s regime’s collapse, after the collapse of a dictatorship, the personal power of Bakiyev and his family, the Kyrgyz people, my native republic will return to the democratic way of development. Kyrgyzstan has no alternative, because Kyrgyzstan’s main resource is human resources. Kyrgyzstan has no convertible natural resources like oil and gas, that’s why Kyrgyzstan can only find support in its human resources. And it’s well-known that human resources are productive only in the conditions of democracy and freedom. So the only way of Kyrgyzstan’s development I can see is the way of democratic development. And I think that today the interim government will face these problems. Of course I hope that they will learn lessons from Bakiyev’s regime. There are a lot of Bakiyev’s administration who came to power together with him in 2005 in the temporary government. All through the first years of their term they were occupied only by dividing power and property, and actually that’s what made Bakiyev’s regime a dictatorship. I want to hope that the temporary government will learn the lessons from the past and will consolidate for the sake of the people, the national interests of Kyrgyzstan, and will do their best to start solving national problems. First of all they are to put everything in order, then to lead the country out of the political and economic crisis. For the last 5 years the economy has been driving towards collapse and today it’s in a terrible state. I am an optimist, I believe in my people, the people of Kyrgyzstan – people who are highly educated and who love freedom. I am sure that Kyrgyzstan has got a great future. This small beautiful country can successfully develop and gain prosperity under good leadership. Of course the only condition for that is that Kyrgyzstan should necessarily follow the democratic way of development in order to use in full the human resources. I think that today Kyrgyzstan’s people have got worthy leaders who will be able to lead Kyrgyzstan along the democratic way of development. There are highly-qualified financial and economic experts, but among the young generation. In the years of my presidency, young experts occupied the posts of heads of the national bank, the ministry of finance, the ministry of posts and telecommunications – they were all talented and promising experts and good politicians. So I think there is a good choice, but with one condition – Kyrgyzstan should be able to organize and hold a free democratic election. Then I am sure people will be able to choose an appropriate leader. There are such people; I just do not want to give names. And I think that the countries of EurAsEC first of all should help in organizing and running a free democratic election in Kyrgyzstan – first of all parliamentary, and then presidential.